At the west side of the Convention Center, where it meets the Marriot, a few guys had large bubble machines that pushed very light suds through human-shaped stencils. 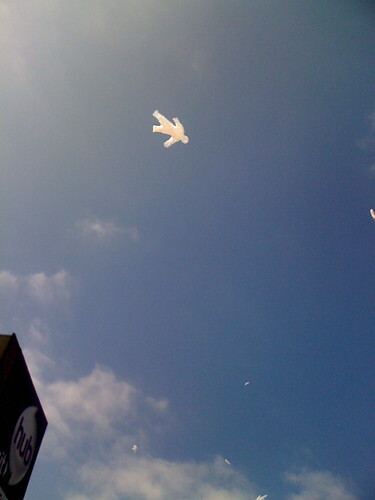 When the guys cut the mass of bubbles away from the stencil, it looked as it people were floating off to the heavens. The process went so fast that lots of them were in the air. Comic-Con attendees were lined up trying to get a good shot. Here’s one of my attempts.